National topics. Local stories. Your voice. From the mountains to the coast, North Carolina’s landscape is as diverse as its people. Following a community discussion about the future of Raleigh, we asked residents about the past, present and future of the state as a whole. According the U.S. Census Bureau, North Carolina was the fifth fastest growing state in 2016-2017. An addition of 116,730 people raised the population to 10.3 million. This growth has created an imbalance of jobs, funding and state resources between rural and urban counties. Many residents saw this divide as one of the biggest issues facing our state. Several respondents to our The State of NC surveys highlighted the rural-urban divide, as well as the political divide. Others discussed the natural beauty and climate that attracts new residents. “[North Carolina has the] perfect combination of weather, food, activities and southern hospitality,” said Don of Pittsboro, N.C.
“We have all four seasons,” said Katherine of Greenville, N.C.
We talked to four North Carolinians in depth about these topics and more. Nick Neptune is an artist and entrepreneur in Raleigh. He is co-founder of The Assembly, a co-working space and creative shop in downtown. He is also behind the Transfer Co. and Morgan Street Food Halls, opening soon in downtown. Dave Olverson moved to Durham two years ago and started a blog, Building Bull City, to share his interests in the history and growth of the city. He starts a masters program in urban and regional planning at UNC-Chapel Hill this fall. Zainab Baloch was the first Muslim woman to run for City Council in 2016. Her campaign focused on making Raleigh healthier, safer and more inclusive. She graduated from N.C. State and is pursuing a Master of Public Administration at UNC-Chapel Hill. Russ Blackburn grew up in Cary, moved away and then returned to North Carolina. Working at Red Hat, he has seen downtown Raleigh change drastically first hand. 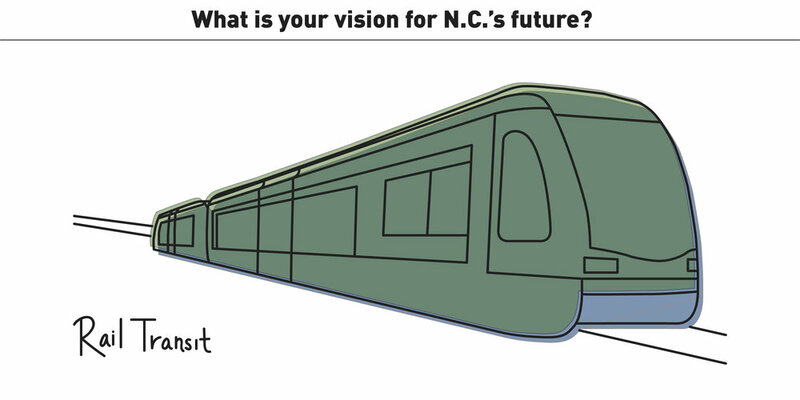 How do North Carolinians envision the future of their state? How would North Carolinians describe their state to an outsider? What makes residents proud of the state they call home? What emerging issue is most important to North Carolinians?